Here is a newsletter (pdf) from Jens Jager, skip of the bronze medal winning team at the 2009 World Championships, celebrating his team's success. It is in German, but loosely translated, it begins: "We did it!! We won the bronze medal and will compete in 2010 at the Paralympic winter games in Vancouver… Hurray! "It was a strong achievement by the entire team: Astrid Hoer, Caren Totzauer, Jens Gäbel, Marcus Sieger, Jens Jager and the staff with Helmar Erlewein (coach), and Marion Demeter (Physio) who kept us all fit. "There was a surprise at the station on our return to Rottweil. 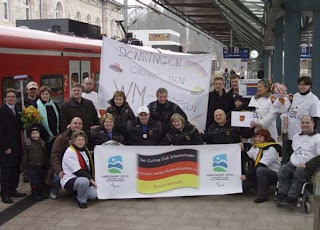 Members of the Schwenningen Curling Club welcomed us with enormous posters and cold sparkling wine. All had new T-shirts printed with “We congratulate the German team." Thank you for this marvelous gift. You are the best!"